Most people think if they go bankrupt it wipes out all their debt. Unfortunately this is not the case. Not all debts can be included in bankruptcy. In this section we look at which debt won't be included if you go bankrupt. Most people think that if they go bankrupt, it will get rid off all of their debts. However, this is not the case, bankruptcy does not clear all debts in all circumstances. 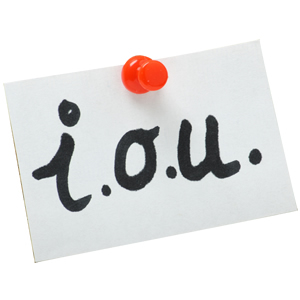 You may still be liable for some debts, even after discharge from bankruptcy. This also includes any new debts you may incur during bankruptcy. Secured debts cannot normally be included in bankruptcy. These debts are secured against property such as your house or car. If the property or car was sold to provide funds towards the bankruptcy, but the amount it sold for did not cover the amount owed on the mortgage, secured loan or hire purchase agreement, then the balance (known as a shortfall) can be included in the bankruptcy. Any debts from an order made in a family or domestic court, such CSA claims for child support are not included in bankruptcy. If the DWP have stated that the over payments of benefits and tax credits were fraudulent, then they can not be included in bankruptcy. Any amounts owing due to personal injury claims against you will not be included in bankruptcy, this often includes debts to the MIB (Motor Insurers' Bureau). Any debts obtained just before bankruptcy, where there was no possibility of the credit agreement being honoured (the debt paid) will be excluded from bankruptcy. Making yourself bankrupt is a big step to take and requires expert debt advice. If you haven't already received advice from us and are considering how to go bankrupt, you can use our online bankruptcy test tool, which will provide you with a a free assessment of whether you qualify for bankruptcy and what impact it will have on your current situation. We'll also send you our "Free Guide to Bankruptcy" by email. Or, if you’d prefer to speak to us, call our FREE Bankruptcy Helpline on 0800 368 8133 (freephone, including all mobiles). Bankruptcy can be an effective way to solve personal debt, however it should ALWAYS be considered as a LAST RESORT, and the Court will expect you to HAVE considered any alternatives that you may qualify for.